one happy little crafter: When is it ok, to get the January Blues??? You may know, from My previous post, that my step-daughter is due to have a C-Section on the 6th February, and this card has been made in anticipation of our new family member. So I'm sure you will excuse me if my card looks a little unfinished, as there will be a sentiment added in the fullness of time. 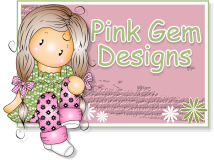 I was delighted to have the opportunity to use this adorable image from Pink Gem - Baby's first Christmas. This is coloured with Promarkers and have also used yummy blue dotty card from Limetree crafts. We hope you will hop on over and join in our challenge......We would love to see you. Gorgeous card Lisa, super cute! What a delightful card and image, this will be much appreciated.